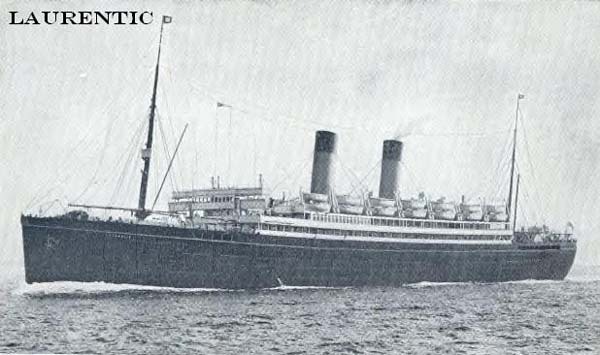 Laurentic was the second White Star Line ship to use this name. The first hit a mine during World War One and sank off the coast of Ireland in 1917. The White Star Line ordered the second Laurentic at a time when they were having financial difficulties. With this ship being built to a tight budget, her design was restricted to a modest 18,724 tons driven by outdated piston type engines. Laurentic set out on her maiden voyage from Liverpool - New York November 12th 1927. Five months later, the White Star Line re-deployed her on the Liverpool - Quebec and Montreal run. The Cunard - White Star merger in 1934 led to the new company using Laurentic to offer cheap cruises. During one of these cruises, Laurentic was traveling through fog in the Irish Sea when she rammed the Blue Star Lines Napier Star; six of the crew lost their lives in the collision. Although repairs were soon completed at Liverpool, she rarely left port in the following years as the depression had by then taken its toll on the cruise industry. The outbreak of World War Two led to Laurentic being converted to an armed merchant cruiser at Plymouth/England. In November 1939, she came across the Hamburg Amerika Lines Antiochia off the coast of Iceland. The German crew set about scuttling their ship at that time to prevent her from falling into the hands of the enemy. Instead of trying to prevent this action, Laurentic’s crew seized the opportunity to use Antiochia as target practice before she sank. The German submarine U-99 torpedoed the Allied vessel Casanare November 3rd 1940. As Laurentic and later the armed merchant cruiser Patroclus approached the area to pick up survivors, U-99 attacked both ships. Laurentic was sunk with three torpedoes and Patroclus with five torpedoes. The British destroyers Achates and Hesperus picked up over 600 survivors of the three ships the following day, more than 100 men were lost with the ships.